Blowout Sale! Free Shipping Included! Save 69% on the Homitt 30 Cans Soft Pack Cooler Insulated Soft Sided Cooler with Hard Liner and Heavy Duty Waterproof TPU Material for Taking Lunch, Camping, Sea Fishing, Daily Trip to Beach, Family Picnic, etc. by Homitt at Time For Everything. MPN: HT-CB01. Hurry! Limited time offer. Offer valid only while supplies last. Homitt tote cooler bag, which is made of high quality and functional integrity make your life easy and convenient on day trips or even vacation! Homitt tote cooler bag, which is made of high quality and functional integrity make your life easy and convenient on day trips or even vacation! Thanks to the high quality 3 layer insulation, this soft cooler keeps your food & drinks cold for a longer time. Unlike those hard coolers, Homitt distinctive oval shape prevent you being scratched from sharp corners. Features plenty of extra storage space, D-buckle can be used to hang key, ribbon, shoulder strap and other small items. Front zippered pocket, back mesh pockets can hold napkins, cutlery, cell phone, etc. Homitt camping cooler is perfect at keeping your food and beverages cold and great for camping, picnic, sporting, ice and medicine storage and so much more. 1.For best results, pre-chill the cooler with ice the night before use. Block ice is preferred as it melts at a slower rate than standard ice cubes. 2.Don't put sharp things in, since it may damage the interior. 3.After each use, wash the interiors with soap and water, wipe it dry, it should get rid of the odor. 4.Tests are done at normal condition, results will vary according to the ambient temperature, the volume, and the starting temperature of the contents. 6.Re-wipe with a soap ,lubricant or candle on the zipper, If the zipper gets stuck. CLOSED-CELL INSULATION CREATS SUPERIOR COOLING EFFECT : High quality 3 layer insulation - leak-proof insulated 840D TPU exterior and 420D TPU interior and high density foam between 2 layers - KEEPS DRINKS & FOODS COLD FOR A LONGER TIME. THE RIGHT SIZE FOR YOU : Fit 30 CANS, exterior size: 18.1"L*13.5"H*10.2"W, interior size: 16.1"L * 9.8"H * 8.6"W. Perfect size for multiple day trip or a day outdoor events, you could place the cooler bag in the trunk of the car when taking to a car trips. EASY TO CARRY AROUND : Equipment with a padded detachable shoulder straps and two sides handle straps. 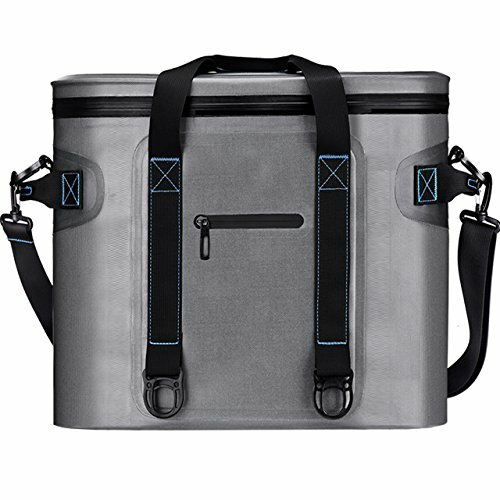 You could pick up the portable cooler bag with the padded shoulder straps for light loads or grab the side handles for heavier ones to make your hands free. NO SWEAT & ANTI-BACTERIAL DESIGN: The cooler is soft but still rigid enough to hold it's shape perfectly. With TPU coating, the exterior is water and sweat resistant. The interior features an antimicrobial liner that resists mold and mildew. Food Grade Material: With airtight zipper, the whole sealing process design, waterproof. Non-toxic, BPA free, you can use it reassurance. Reliable quality, competitive prices & professional after sale service, buy one and last a lifetime.